Extracting the lovey-dovey DNA from Twilight, swapping vampires for witches, Beautiful Creatures is Hollywood's latest attempt to milk the cash cow that is the mortal-falls-for-an-immortal narrative. Sadly for the coven, a supernatural spell of boringness smothers it all. 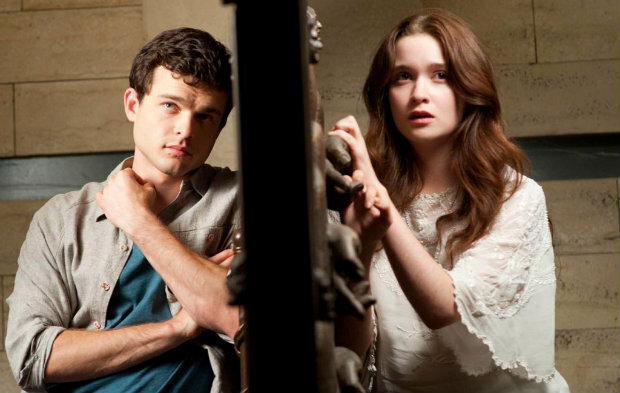 Set in the fictional South Carolina burg of Gatlin, smarter-than-your-average-hick Ethan (Alden Ehrenreich) takes a liking to the new girl, Lena (Alice Englert), an alluring oddball who happens to be the niece of Gatlin's mysterious, holed-up-in-a-spooky-old-mansion misfit, Macon Ravenwood (Jeremy Irons). But as Edward and Bella - and six million other fictional characters - proved, love knows no bounds. Ethan falls dizzyingly for Lena, enduring a Gravitron-esque table-spinning courtesy of Lena's turned-to-the-dark-side sis and co-"Caster", Ridley (Emmy Rossum). Performances aren't Beautiful Creatures' problem, Ehrenreich has "star" written all over him and the trio of Irons, Emma Thompson and Viola Davis elevate the project by simply showing up on screen. The movie's issues arise from writer/director Richard LaGravenese's (the man responsible for the saptacular P.S. I Love You) inability to edit the film down to anything resembling streamlined. After a witty, effervescent launch, the films bogs down as LaGravenese clutches a Bible-like reverence to his source material, the 2009 bestselling novel. Best of luck figuring out which - if any - of its 593 pages missed the final cut, as after two hours plus, we eventually arrive at the humdrum conclusion. I lost count of my watch-checkings at 12 – roughly. If Warner Bros. has plans to bring the series' remaining three books to the big screen, they'd best find a different director/screenwriter to punch things up. For something dealing with witches, spells and sorcerous stuff, Beautiful Creatures is damn dull. Any chance the ladies from Charmed are game for a cinematic reunion?